MERRITT ISLAND, Florida -- NASA managers conducted a weather briefing Tuesday morning and gave a "go" to proceed toward the planned 7:15 a.m. EDT departure of NASA's Shuttle Carrier Aircraft, or SCA, and space shuttle Endeavour from Kennedy Space Center in Florida. A final weather review will be held at 5 a.m. Wednesday. A cold front that twice delayed the start of Endeavour's ferry flight to Los Angeles International Airport, or LAX, is predicted to move far enough away from the flight path to permit takeoff. The worst weather in the Kennedy area will be offshore to the east. Today, thunderstorms are expected over Kennedy, so the SCA/Endeavour has been moved inside the Shuttle Landing Facility's Mate-Demate Device for protection. The SCA will back out of the structure at 4 a.m. Wednesday. 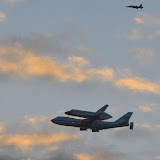 At sunrise on Sept. 19, the SCA and Endeavour will depart Kennedy's Shuttle Landing Facility in Merritt Island, Florida. Following takeoff, the SCA will head south along the coast and turn back north above the Indian River for one final low pass along Florida's Space Coast, including Kennedy, the Kennedy Space Center Visitor Complex, Cape Canaveral Air Force Station, Cocoa Beach, Cape Canaveral and Patrick Air Force Base.